Considering that Hartford Technologies has content in ⅔ of North American vehicles, almost every driver enjoys the benefits of our products each day – without realizing it! Each time you adjust your car seat, there is a good chance one of our assemblies provides the smooth sliding motion. Hartford Technologies has manufactured custom bearing assemblies and components for seating and many other automotive uses for more than 35 years. Whether the retainer is metal or plastic, we use state-of-the-art vision systems to detect the presence of the balls and rollers to ensure every assembly is perfect. Hartford Technologies is ISO 9001, IATF 16949 and ISO 14001 certified. With our products in ⅔ of North American vehicles, almost every driver enjoys the benefits of our products each day – without realizing it! Many automotive door locks use small bearing retainers with balls to assist in the rotation of the locking mechanism. During the manufacturing of large cast engine parts a number of holes are drilled as access areas for machining. Once the casting is completed these holes are plugged with precision balls. Many precision balls are used in automotive valve applications to regulate the flow of air such as in fuel injection valves. Stainless steel balls are often used in the check valves installed in automotive gas tanks to ensure no gasoline is spilled in a rollover incident. Custom bearing assemblies are used in many special automotive seating applications such as "stow and go". Precision balls are used in the pre-tensioning device of seat belt retractors. 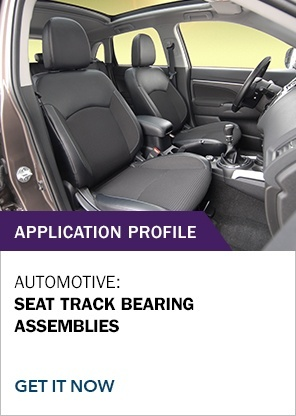 Seat Track Rail Ball Bearings facilitate a smooth and quiet sliding action of the automotive seat rail mechanism to move the seat forward or backward. Several incremental ball sizes are generally used to compensate for variations in the stamped or rolled form rails. Loose balls or bearing retainer assemblies with balls and/or rollers are commonly used. These are miniature linear bearings that are installed in rails in the back of the rear view mirror. When the transmission is in reverse a video screen attached to the rails slides out to view what is in back of the vehicle. This was the earliest application for the rear view camera. Today most vehicles have the screen mounted in the nav station. Various types of ball bearings are used to facilitate the linear movement of the sliding doors installed in many vans, SUV’s and utility vehicles. Precision ball bearings and many custom bearing assemblies are installed in automotive steering columns to allow the steering wheel to rotate freely. Vehicles with automatic trunk openers often use ball bearings to aid in the opening of the trunk with a smooth and quiet motion.